I am still in disbelief that I am going to have two boys. I am not sure why this pregnancy is taking so long to sink in. I can picture what our life will be like but I still cant believe it. My whole life I have always wanted to be a mom and wife. I guess more than anything else. Well I have already accomplished both. I couldnt be happier with my family. I guess I am just used to the three of us. 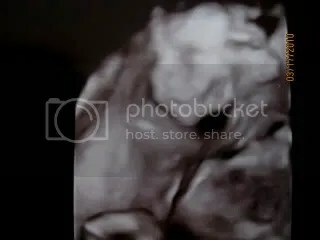 As I sit here and type our baby boy is moving all around, I can feel him kick and squirm and still, it hasnt hit me. I am not sure what it is going to take to get me to realize that I am going to have two beautiful boys. I think alot of it has to do with our uncertain future. We dont know where we will be settling down in the next year or two. It really shouldnt matter where we are as long as we are all together. With Brians new job in sales we are unsure of what kind of schedule he will have and if he will be traveling often. If he does travel alot we will want to settle closer to family as I will not want to be alone with two kids all the time. But we dont want him to be gone that much. Been there and done that. Its not fun! So I guess part of the reason my future is so unclear is the fact that we just dont know where we will be. We will figure it out soon I am sure. For now I will just prepare for the arrival of our new boy!!!! Here is our little guy again, I cant stop looking at him.